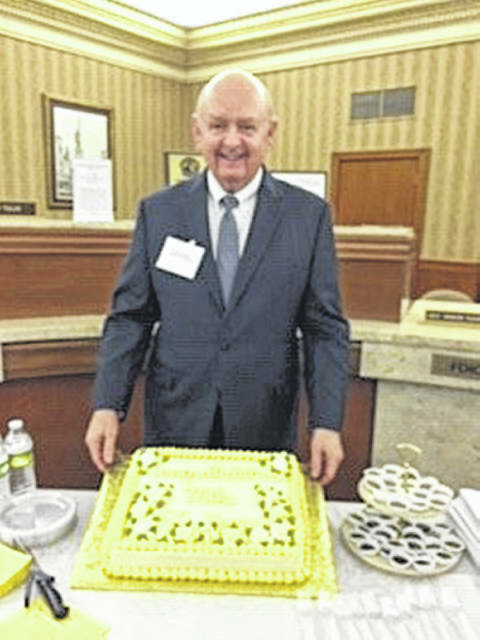 Michael Melvin, president of Perpetual Federal Savings Bank, was honored for his 50 years of service during the annual stockholders meeting. Perpetual Federal Savings Bank of Urbana held its annual stockholders meeting on Wednesday, Jan. 23. Dr. Steven R. Bohl, board chairman, opened the meeting with a special recognition of the bank’s president, Michael R. Melvin, who completed 50 years of service earlier this month. The entire staff was on hand for the surprise presentation, as well as family and friends. Also receiving recognition for 25 years of service to the bank was Liza C. Souders, which now brings the active number of staff with 25 or more years of service to seven. Chris Phelps, exec. vice president and secretary to the board, reported to the stockholders in attendance that Bohl and Melvin were both re-elected to three-year terms on the board, joining Jesse L. Henson, Hobert H. Neiswander, David P. Vernon, Scott A. Fannin and M. Todd Woodruff. Melvin reported to the shareholders that assets as of Dec. 31, 2018, were at $390 million and shareholder equity was at $73.5 million (18.8 percent), well exceeding regulatory requirements, and that the bank paid dividends of $1.19 per share for the calendar year 2018. For the fourth consecutive year, the bank was the recipient of the Bauer Financial Service Five Star Award. Submitted by Perpetual Federal Savings Bank.